Do you have a large collection of DVD's or DivX movies in your cub board, but don't know how to play them independently without a desktop PC or don't want to connect your PC to TV via TV-out for obvious reasons or Do you have a Playstation 2 but don't know how to make an optimum use of your investment? In 10 mins you will learn how you can convert your same old PS2 into a Home Entertainment HUB. DVD burners and DVD-Rom's becoming cheaper day-by-day, its really convenient to backup all your movies into DVD's or backup your mini library into compress Xvid or DivX file format. You can store as-many-as six movies into one DVD in Xvid format. Of course you can opt for new DivX players available in market, but wait, are these players good enough? I don't think so. Why should one opt for PS2 rather than some media player? One, you can play cool PS2 games, all the neighboring kids will envy you and befriend you. Two, you can play DVD's, CD's. Three, you can play DivX and Xvid file format movies. Four, you can listen to all those MP3's that you have collected since 1972. Five, you can play all the movies from USB hard-disk. Disclaimer! Ensure that you legally own the original movies which you backup in DivX or Xvid formats. I take no responsibility for any damage to your property. Take your own risk. 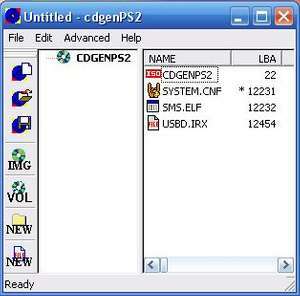 SMS is a DivX and MP3 player for the PS2. Using SMS, you can stream movies and music right to your TV. forget about all the set-top boxes, forget about the 'Media PC', if you have a PS2, you have all the hardware you need. Copy your movies and mp3's to your internal HDD! 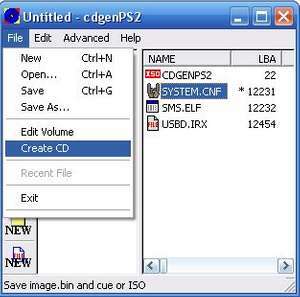 SMS can even read DVD-RW discs specially formatted with the DVD-Video filesystem, or CD-R Discs formatted with CDDAFS without needing a modchip or any Swap tricks. Download USB.irx file which is part of Naplink. Note: There are other Media players for PS2, But I chose SMS because I find it most efficient. 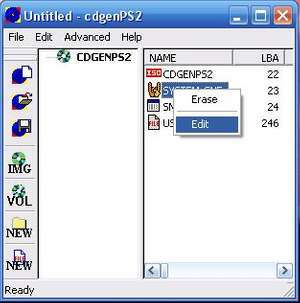 Extract the CDGenPS2 zip file to any location on your drive. 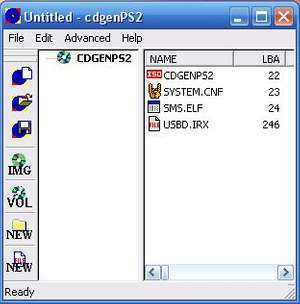 Launch the CDGenPS2 exe file. Right click on "System.cnf" and click "Edit", check "Fix LBA", type 12231 in LBA "text box"
Voila! Burn to a CD (not DVD) using any of your favourite CD-Writer software. Place the newly created CD into your PS2. Power On. After the SMS player loads up. Replace the CD, with any DVD or CD which contains the DivX / Xvid or MP3's, just browse and play the files. If you want, I have created a CD-Image for you. Download SMS Player CD-Image Zip, extract it, then burn it to your CD.